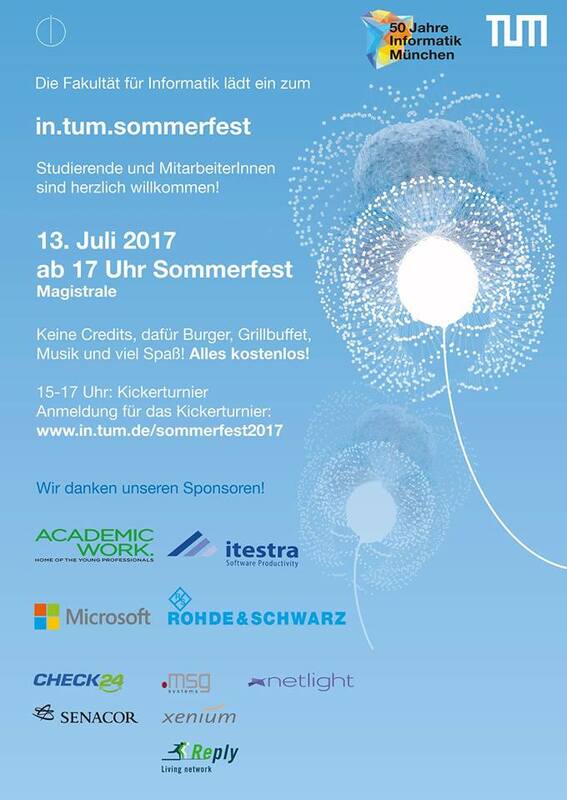 You’re all invited to the in.tum.summerparty 2017! Get to know other people from the Informatics Department with good food, drinks and music. The summerparty is for all students and employees of the Informatics Department. At 3 p.m. the table soccer tournament starts. The tournament is organized by us, registration is required at veranstaltung@fs.tum.de. Afterwards the Dean, Prof. Hans-Joachim Bungartz, will greet you all to the evening. At 5 p.m. the traditional barbeque starts, including a jubilee burger. At 7:45 p.m. theEgg Drop Contest begins. Ahead of the event you can participate in the Photo Competition. Go looking for one of the big “50 Years Informatics Munich” posters and take a selfie with it. Send it to pr@in.tum.de until the July 10th and save your chance for great prizes. The winners will be announced on the summerparty. More information about the in.tum.summerparty can be found on www.in.tum.de/summerparty2017 or on Facebook.